On this site you can read essays about alternative perspectives and “out of the box” research on water and the environment. Each month a new essay is published, together with a “Read more”-section with links to more information on the month’s subject. The essays highlight in an easy and accessible language interesting examples of unconventional water research. Many of the research areas presented in the essays are covered by the IWONE conferences (International Workshop on Natural Energies) organized by the Institute of Ecological Technology. watercalendar.com is published by Alternativa Bokförlaget, Göteborg. Sweden. The essays at watercalendar.com are written by Lasse Johansson, Institute of Ecological Technology, Sweden. 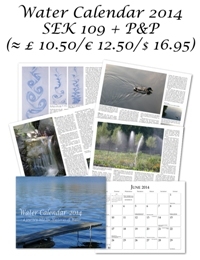 The essays and images of watercalendar.com are also available as a beautiful wall calendar (with one essay for each month). In the 2013 calendar, we meet Viktor Schauberger’s unconventional river restoration and timber floating, flowforms, self-organization and flow patterns of water, water and climate change, the role of water in biodynamic agriculture, reflections on water quality, ice images of different kinds of water, research on the effects of consciousness on water, research on excess energy from water, and more.